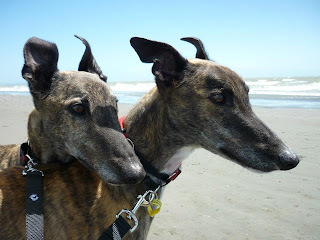 After adopting Sam (Thrilling Mix) in May 2011, we decided that some company for him would be in order. Not in a position to permanently adopt a second dog, we gave foster caring a go. 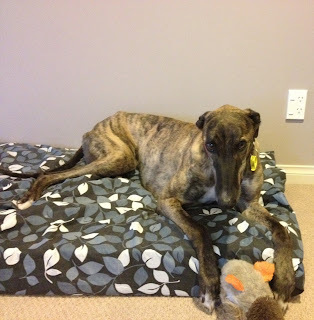 After one foster hound Lucky, along came Sparkie (Octane Spark) and we just knew he wouldn't be leaving anytime soon! Yes, we are another casualty of the GAP foster scheme – I think they saw me coming a mile away! Sparkie arrived just before Christmas, and became a permanent member of the family in mid January. Sparkie has settled in very quickly, and seemed completely comfortable with his change in surrounds after just one day. Getting his diet sorted has meant a bit of trial and error as he doesn't seem to tolerate Nutrience kibble, but we are slowly working on it and he has started to gain a bit of much needed weight. He had a fairly successful racing career, much better than Sam, yet he is a much calmer dog and really does love to be horizontal for most of the day. Maybe he feels he has really earned his retirement and is going to do his level best to enjoy it! His most endearing habit is his love of cockroaching, although what makes it so cute is the loud grunts that accompany it as he gets himself into just. the. right. position. Ahhhh… there it is! Sparkie and Sam get on really well and often snuggle up together in the back of the car (although truth be told, this is probably just Sam’s way of taking up the maximum amount of space possible). We are constantly asked if they are brothers because of their similar markings, but I must admit it’s quite nice to have a matching pair! Initially it was quite confusing telling the two apart when they were on their own – it was much easier when they’re together – but we’ve (mostly) got the hang of it now. 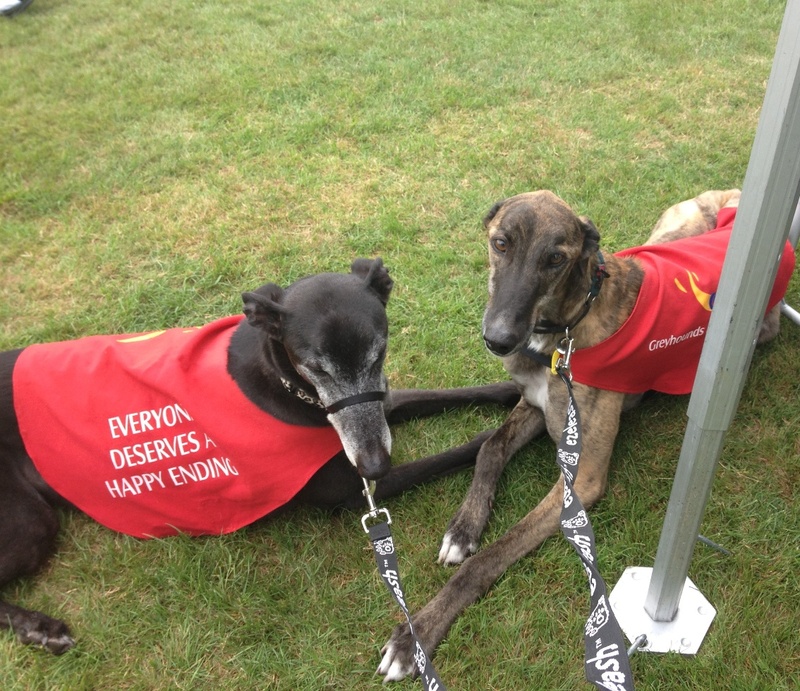 He loves to meet other dogs, and we took him to a GAP event in Waikanae recently where he made friends with Billy (Dynamic Keroma) – they decided to have a little lie down together. We also discovered that, despite the one year age difference, Sam and Sparkie's birthdays are only two days apart – similar colours, similar birthdays – we couldn’t have asked for a better match! Thanks again GAP! Great to see Sparkie so happy in his retirement. He was a very cruizy greyhound to train, was no bother and got on with all the other dogs. Pleased to see he has found a great home.